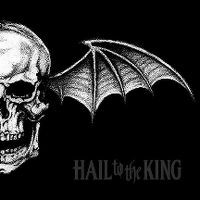 Good metal album from Avenged Sevenfold. It seems that their sound has a few influences from (mostly) Metallica, along with a bit of Rage Against the Machine and Bullet For My Valentine, and a few other metal bands. For me, it's not one of those albums I would listen to repetitively and all at one go, but occasionally. Ich bin durch "Classic Rock" auf die Jungs aufmerksam geworden. "This means war" und der Titelsong "Hail to the king" finde ich besonders gut.